The passenger compartment remained stable in the frontal offset test. Dummy readings showed good protection of the knees and femurs of the driver and passenger. Toyota showed that a similar level of protection would be provided for occupants of different sizes and to those sat in different positions. The driver's airbag was insufficiently inflated to prevent 'bottoming out', and the head contacted the steering wheel through the airbag material. Although dummy readings were not hazardous, the score was penalised and protection rated as adequate. Protection of the passenger dummy was good for all critical body areas. 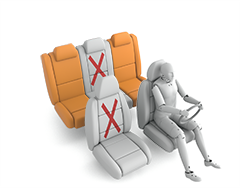 In the full width rigid barrier test, protection was good except for the chest of the front seat driver, protection of which was adequate and the chest of the rear seat passenger, protection of which was marginal. In both the side impact barrier test and the more severe side pole impact, the Hilux scored maximum points with good protection of all critical body regions. 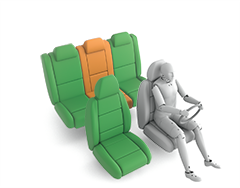 Likewise, tests showed that the whiplash protection provided by the front seats and head restraints was good in the event of a rear end collision and a geometric assessment of the rear seats indicated good protection there also. Increased whiplash protection is provided by an autonomous emergency braking system, available as part of the option pack and not included in this assessment. In the frontal offset test, neck tension and chest deceleration revealed, respectively, marginal and weak protection for those body areas in the 6 year dummy. Protection of the 10 year dummy was good, apart from adequate protection of the neck, and, in the side impact was good for all critical body areas for both child dummies. 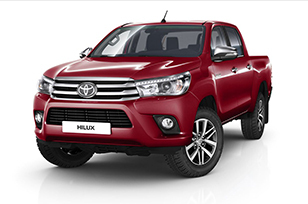 The Hilux has an automatic system for disabling the front passenger airbag when, for example, a rearward-facing child restrain is used in that position. The system met Euro NCAP's requirements and was rewarded. All child restraints for which the Hilux is designed could be accommodated. However, the group 1 ISOFIX seat needed care to ensure correct installation and the rear centre seat is deemed unsuitable for child restraints by Toyota, although restraints could be properly installed there. The bonnet provided good or adequate head protection over most of its surface, with some poorer results only along the front edge and on the stiff windscreen pillars. Protection provided by the bumper to pedestrians' legs, and the protection provided to the pelvis, was good at all points tested. An autonomous emergency braking system capable of detecting pedestrians is available as an option and its results are not included in this rating. The Hilux has a seatbelt reminder system as standard, covering the front and rear seats. All other items relevant to Safety Assist are provided in the optional safety pack and are not included in this assessment.